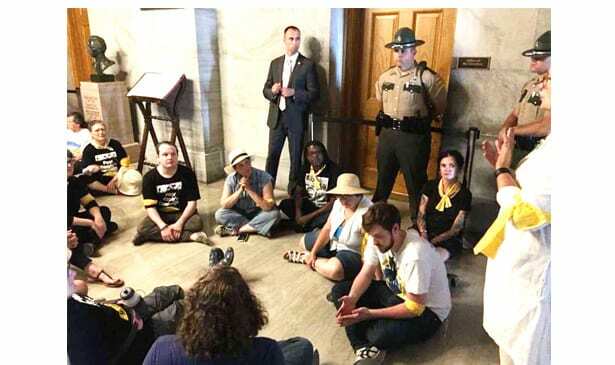 NASHVILLE, TN — Calling on lawmakers to guarantee healthcare and a healthy environment for all, 20 people including the poor, clergy and advocates were arrested the state capitol building Monday as the Tennessee Poor People’s Campaign: A National Call for Moral Revival intensified during its fourth straight week of nonviolent direct action. The action in Tennessee was part of a wave of protests hitting 35 state capitals and Washington, D.C.
Monday’s protest highlighted how environmental issues like pollution and climate change disproportionately affect people living in poverty. 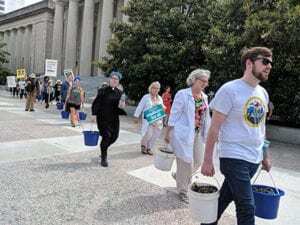 Earlier today moral witnesses reclaimed land on the Tennessee State Capitol lawn to create a People’s Garden highlighting the ecological devastation of our planet and the need for healthy food, water, and air for healthy communities. Monday’s protest highlighted how environmental issues like pollution and climate change disproportionately affect people living in poverty. 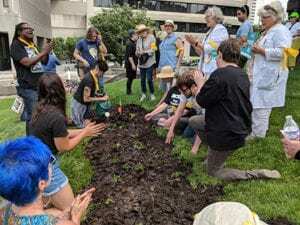 Earlier today moral witnesses reclaimed land on the Tennessee State Capitol lawn to create a People’s Garden highlighting the ecological devastation of our planet and the need for healthy food, water, and air for healthy communities. They later proceeded to the Governor’s Office to speak to the Governor. He and his constituency services staff refused to speak to them. They were later arrested outside of the Governor’s Office. 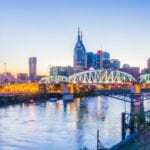 The action in Tennessee is one of dozens nationwide. In Tennessee the campaign is organized by the poor and dispossessed, clergy and those who care about justice from across the state, from Chattanooga to Memphis, in cooperation with Mercy Junction Peace and Justice Center in Chattanooga, Union Auto Workers UAW 737, No Exceptions Prison Collective, Veterans for Peace, Christ Lutheran Church, Christ Church Cathedral, Murfreesboro Unitarian Universalist Fellowship, First Unitarian Universalist Church of Nashville and Greater Unitarian Universalist Congregation of Nashville. “Politicians in Kentucky are afraid to hear a true critique of their policies, which rob the poor of the right to healthcare and allow billion-dollar companies to pollute our water and environment, but we will not be silenced by their descent into authoritarianism,” said the Rev. Barber. Kentuckians are protesting against the state’s decision to require Medicaid recipients to work or participate in job training or community service in order to keep their healthcare coverage. Kentucky coal miners suffering from black lung and residents affected by contaminated water spoke at the capitol earlier Monday highlighting how billion-dollar companies are polluting the environment and water and harming public health in the state. In Michigan Monday afternoon, Poor People’s Campaign Co-Chair the Rev. Dr. Liz Theoharis is leading a blockade of the Michigan Department of Environmental Quality, blasting lawmakers over their failure to address the ongoing water crisis in Detroit and Flint. Holding signs reading “Water is a human right,” residents of Flint whose water remains poisoned from lead exposure spoke at a rally earlier Monday alongside low-income Detroiters whose water has been shut off because they cannot afford their bills. Poor People’s Campaign protests also intensified on Capitol Hill Monday as members of heavyweight environmental groups including 350.org, Friends of the Earth, the People’s Climate March and the Sierra Club joined the movement to highlight how environmental issues like climate change and pollution disproportionately affect people living in poverty. Before engaging in nonviolent civil disobedience, protesters at the Capitol Monday highlighted the ongoing humanitarian catastrophe in Puerto Rico, where a recent Harvard University Study estimates more than 4,600 people died as a result of Hurricane Maria—many of them from delayed medical care. To spotlight the connection between a healthy environment and a healthy body, more than 1,000 people across 40 states and eight countries who are part of the Franciscan Action Network are fasting Monday in solidarity with the Poor People’s Campaign. In 35 state capitals, poor people, clergy and advocates demanded the right to healthcare and a healthy environment for all. The protests Monday come days after U.N. officials sounded the alarm on the Trump administration’s efforts to undermine social safety net programs for the poor. On Saturday, Philip Alston, U.N. special rapporteur on extreme poverty, criticized rollbacks to healthcare and welfare benefits in the U.S. over the past year, which aim to “punish those who are not in employment and make even basic health care into a privilege to be earned rather than a right of citizenship,” Alston said. He said that under the Trump administration and the current Congress, America’s poor are becoming more destitute. Over the past two years, leaders of the Poor People’s Campaign: A National Call for Moral Revival have been laying the groundwork for this week’s protests. They carried out a listening tour in dozens of states across this nation, meeting with tens of thousands of people from El Paso, Texas to Marks, Mississippi to South Charleston, West Virginia. Led by the Revs. Barber and Theoharis, the campaign has gathered testimonies from hundreds of poor people and listened to their demands for a better society. A Poor People’s Campaign Moral Agenda, announced in April, was drawn from this listening tour, while an audit of America conducted with allied organizations, including the Institute for Policy Studies and the Urban Institute, showed that, in many ways, we are worse off than we were in 1968. Earlier this year, poor people, clergy and advocates traveled to statehouses all over the country and the U.S. Capitol to serve notice on lawmakers of the demand that they address the enmeshed evils of systemic racism, poverty, the war economy, ecological devastation and America’s distorted national morality. Lawmakers have failed to act, and this spring’s six weeks of nonviolent moral fusion direct action is yet another attempt to instruct them on these issues. Previous articleWhat’s Behind Clenching and Grinding Teeth?